Take my fabric. Please. - Stop staring and start sewing! I received 4 big boxes from Free Spirit yesterday (a 5th box is stuck somewhere and I'm hoping it gets here soon) so I've restocked a bunch of lines (and added some I didn't get the first time around). Rather than go down the list I thought I'd just take a picture (yes, that's Jennifer's zebra print!) in case there was one you were waiting for. Some of the Bell Bottom I bought were at discounted prices because it's out of production (but don't worry, Jennifer has 2 more lines coming!!) so I've knocked the whole line down to 7.00 except for the black and white which haven't been discounted yet (which is good news because it means they are still making it). There are a couple of lines that just aren't moving for me (see that messy little stack in the bottom left hand corner?) and I really want to clear them out because, to be honest, I get crabby looking at them sitting there gathering dust. They're beautiful but I think they might be a little bit outside of what people expect to find at my store. Anyway, I've marked them down to a crazy 5.00 a yard and I'm telling all my fun and fabulous blog readers (you know who you are) before I send out a notice to everybody on my mailing list (Saturday). So you get first dibs! Oh I guess it would help if I told you which ones, huh? Okay, Recipe for Friendship and Oh Cherry Oh (including jelly rolls for less than I paid and super cheap charm packs). Oh, and don't forget...you can use the 15% off coupon code (marchmadness09) on these and get them super duper cheap (just through the 27th)! There are some great lines coming out soon and I'm so happy that David Walker has created another line for boys! Dinosaurs, sailboats, bears, airplanes! If you love his Robots line you're going to be thrilled! Also, go check out the artwork of Douglas Day because he has a great line for the guys coming out fittingly called "Be a Man". Lugnuts, tires, tools, and beer (perfect for a little burp rag!!)! Tanya Whelan has a couple on the horizon (yippy!) including Darla Too! 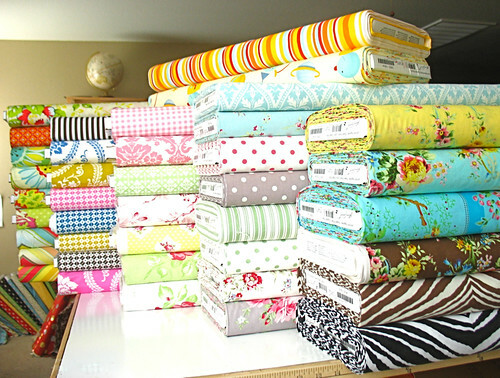 and I've finally ordered some from Anna Griffin (her fabric is sooo soft) which should be here within a week. It never ends!! Aren't you glad? ?